The Opticron IS 70 R offers a great mix of style, performance and adaptability and is an ideal choice for anyone wanting a high specification entry level spotting scope for target shooting, birdwatching or plane spotting. Featuring an F400mm, 4-element objective lens with a surface area 35% greater than the IS 60 WP, images are brighter and the scopes offer higher top-end magnification. IS 70 R fieldscopes benefit from a re-engineered optical system to improve light transmission and resolution and deliver bright, crisp images with good colour contrast. In line with our commitment to offer the best choice of eyepieces to suit your budget and application, the ‘scopes are fully compatible with IS, HR2, HDF and SDL eyepieces. 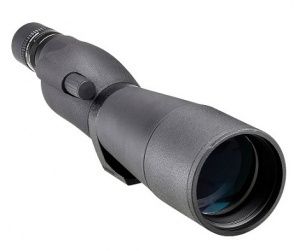 For general use we recommend either of the IS eyepieces or the 40933S HR2 18-54x zoom eyepiece. The lightweight ABS polycarbonate body is 100% nitrogen waterproof and covered in a protective rubber armour for a reassuring feeling of quality as well as giving extra protection against and knocks and bumps. The models feature a +/- 90 rotating tripod sleeve for maximum positional flexibility when attached to a tripod or bipod, retractable sunshade to reduce glare and are supplied with a comprehensive 10 year warranty.